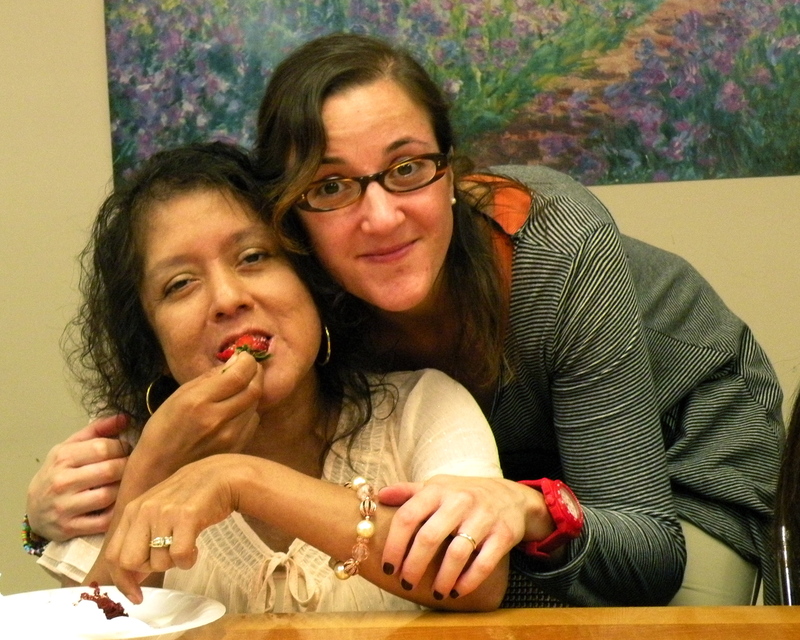 On Tuesday, January 28th, my co-worker Lilia González passed away after her courageous battle with leukemia. Even when I know she’s now resting in peace, I’m selfish to see her go, I’m sad that we didn’t say goodbye properly and I can’t imagine what will be like going back to work in April and not having her by my side, with her smile, enthusiasm and dedication for social justice. It was a very hard week emotionally, but also one in which I grew enormously, surrounded by the kindness and love from my new brothers and sisters. I cried with them for the first time and they cried with me. I’ve strengthened bonds, made new friends and found guidance when I least expected it. Special thanks to Brenda Sunoo, our professor’s wife, who was an amazing support and guide during this time of grief. Being away at this time was very hard. I wrote this letter to my colleagues last night, as I wanted to be closer to them in what’s been a terrible loss, the death of our dearest Lily. With a broken heart and from the distance, I received the news of our Lily leaving us this week. She’s resting in peace now and I wish we had said goodbye. I’d like to call to the office today and talk to you, hear your voices and see how you’re all doing. It’s Friday night here and I found out of Lilia’s passing on Wednesday midnight before I was going to bed. Thanks to Nancy and Desiree for reaching out. Yesterday, in class, we had a minute of silence in her honor and prayed together. I’ve found refuge on new friends and I’m blessed for that, as I’m so far away from all of you, with whom I wish I could be at this moment. I never thought the time would come so soon, and yet, we almost lost Lily in many occasions in the last 6 years since her diagnosis when she was pregnant with Ashley. When we face loss of a loved one, we’re often selfish and think of how we will miss that person. With Lily, even when we knew how much she had suffered, in a way we thought she would get better. She tricked us with her smile and energy, as she was so positive, optimistic and cheerful all the time. Even when she was facing many challenges physically, her spirit was unbreakable and that’s what kept her going. She was a warrior. It will be hard to go back to the office and not have her there. I wish I had told her more often how strongly she influenced our daily lives at LAFLA and what an inspiration she was to me. I will always treasure her smile, her strength and the deep and the meaningful conversations we had together in and out of the office – and I wish I had found more time for those. This has been a hard week for all of you and I hope you’re able to grief her passing and acknowledge her strength and dedication. I’ve read some of your emails to feel closer to you, and cried a lot. I’m sure you have too. I hope you find the space to discuss all these feelings with each other. In the last 4 years I’ve lost many dear people close to my heart: my father, one of my best friends…and more. I have to admit that not giving myself enough time to grief and to acknowledge the feelings have made each loss harder than the last one. I hope you can find peace to be with all the feelings that this loss brings us. I also hope time will heal the pain that we all feel now and that we can move on to remember Lily with the usual happiness that she spread all around her. Sending you a big hug, missing you lots! Hi Caro. It’ me justin (lily’s son). I’m not sure if you remember me, i used to go with my mom to her work. Anyways, i just found this and my family and i want to say thank you for writing this. We appreciate it.